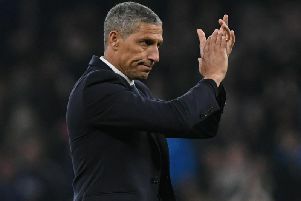 Brighton & Hove Albion left-back Bernardo was left frustrated with the result but satisfied with his performance as he came up against a top-six side for the first time on Sunday. The Brazilian full-back made his eighth appearance of the season in Albion’s 2-1 defeat at home to Chelsea. Bernardo, who has started Brighton’s last five top-flight games, admitted afterwards that testing himself against the Premier League’s top sides was why he joined Albion from RB Leipzig in the summer. Asked how he found it coming up against the likes of Eden Hazard, Willian and Pedro, Bernardo said: “It’s really difficult but that’s why I came to this league. “I wanted to prove to myself that I have enough level to play against these players. “You only know your level when you test yourself against these kind of players with this type of quality. Looking back on the match, Bernardo said: “At the end it was a bit frustrating, in the second half especially we showed that we could have had a better match or got a better result. “It’s always difficult to play against such a good team as Chelsea but we showed at the end we could have got something out of it and that’s why we have this kind of frustration. “The first half overall was not good. There were too many mistakes, too many passes that we lost without having pressure or anything. “The gaffer spoke to us at half-time and we came out with a different mentality. We understood we could do something to change the match and that’s what we tried to do. “We hustled a lot, got the first goal and then tried to get a second one but unfortunately we didn’t manage to.